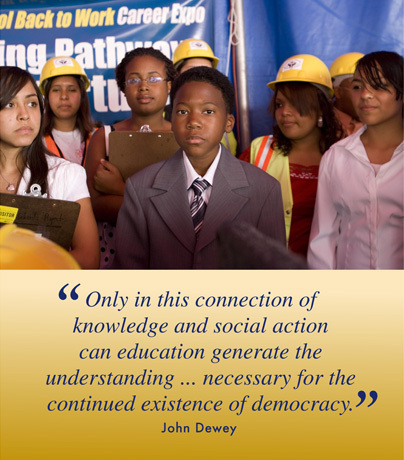 The Institute for Democracy, Education, and Access is a network of UCLA scholars and students, professionals in schools and public agencies, advocates, community activists, and urban youth. IDEA's mission is to make high quality public schooling and successful college participation routine occurrence in low income neighborhoods of color. Research and advocacy are the tools IDEA uses to empower individuals, build relationships, and create knowledge for civic participation and social change. Linking a great public research university with committed educators and supportive community alliances, IDEA seeks to become the intellectual home of a broad based social movement that challenges the pervasive racial and social class inequalities in Los Angeles and in cities around the nation. IDEA's research and action begins with the premise that all students have a fundamental right to a public education that enables them to graduate from high school prepared to become active citizens, eligible for four-year universities, and eager for meaningful work. Echoing the promise made in Brown vs. Board of Education nearly 50 years ago, IDEA insists that this education must be provided to all "on equal terms." IDEA's work advances a deep understanding of the causes and costs of educational inequality. It engages a remarkable group of urban teachers in creating examples of equitable public schooling and college access. It fosters public engagement, policy advocacy, and action infused with youth and community voices. Above all, IDEA seeks to make a difference. School and Society in the Age of Trump examines how a broad set of social issues at the forefront of the Trump presidency are felt and affect students and educators within America’s high schools.